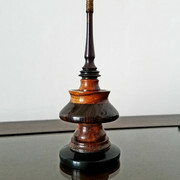 There is no metal in any of these tops, as I am simply a woodworker and have no skill with metalwork like Iacopo. 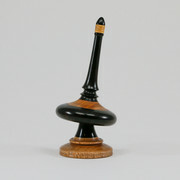 I have been making precision spinning tops for two years, as well as collect them. I have made over 270 tops to date. Very nice! Maxwell would approve! Does the first one have an acrylic stem? Ok! Wow!! Very nice Phil. Thanks for sharing those. 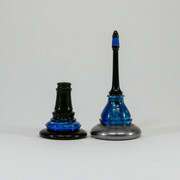 The all-resin top has a clear acrylic stem. One of my signature elements in every top I make is the thread grip. 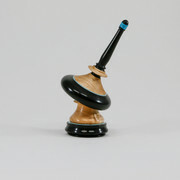 It offers a great grip to apply spinning torque, and is available in dozens of colors to match, contrast, or complement the coloring of the top, be it wood, or resin. The other two Maxwells are wood varieties. This has the center of mass (COM) below the spin point, as proven by the very simple "hanging test". If precession is prograde (same direction as spin), CM is above contact. If retrograde (opposite to spin), CM is below. If no precession at all, CM is exactly at contact. 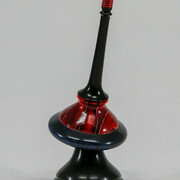 If prograde, I consider the spintoy a true top. If retrograde, a "spindulum". Still looking for a catchy name if no precession. Test is readily confirmed with any top with an adjustable CM-contact distance on a low-friction support -- e.g., Maxwell's dynamical top and many of my LEGO tops. I very much like your test, (being consistent with Maxwell's original observations of 1856) and the name "spindulum"! I made another Maxwell. This one is a spindulum also. Gorgeous! Same question as the Earl. Color kinda reminds me of malachite, but internal patterns look wrong, and it may be too soft for precision machining. 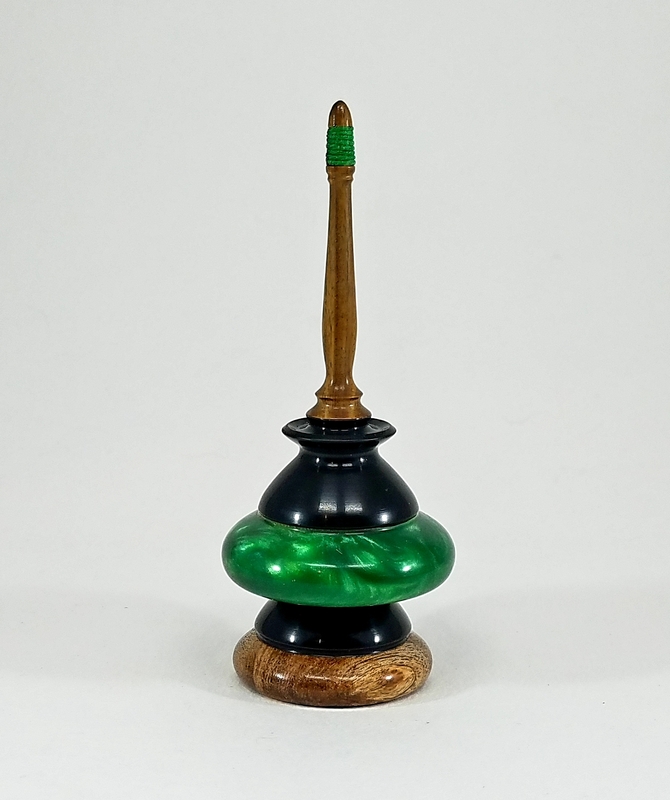 This latest top is made of cast polyresin, Delrin, and Lignum Vitae. 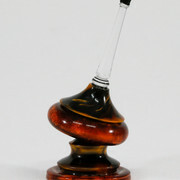 It stands 6" tall and weighs a massive 33g! It spins for about 8 minutes. Another Maxwell top I made recently. This is all resin, but the flywheel contains tungsten powder to add mass. Not a lot of mass as the top still only weighs 22g -- haha! The flywheel on this Maxwell is lead.